If you’re an American Filipino, an Asian American foodie, or anyone who relishes fresh, local food—before you take another bite, take the time to remember who picked it. 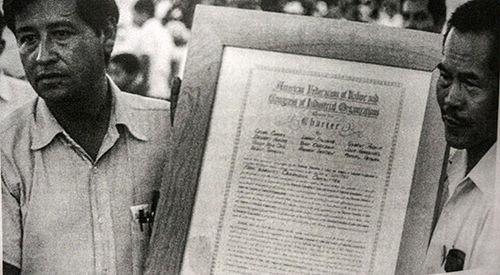 Then look up to the skies and thank the Filipinos in the fields of California who brought about fairness, civil rights, and social justice to the farm labor movement with the strike that changed everything.Fifty years ago, on Sept. 8, 1965, the Delano Grape Strike began. Wasn’t that the strike that turned Cesar Chavez into an American saint? Yeah, sort of. Let’s take nothing away from the non-violent protest acumen of Chavez. But it all came at the expense of the veteran labor strategist who made the strike happen, Larry Itliong.My Labor Day weekend celebration was spent driving more than six hours round trip to Delano, California, deep in the Central Valley, to a place called Filipino Community Hall. That’s where the Filipino American National Historical Society celebrated the 50th anniversary of that bold first step of Filipinos in the fields. You don’t have to be Filipino to make a mecca-like journey to 1457 Glenwood St. in Delano. It’s an ordinary looking multi-purpose building where Itliong and members of the Agricultural Workers Organizing Committee made history.I’ve driven through Delano, but have never been to the hall. Still, I knew enough about the Delano story and felt the gravitational pull to make the pilgrimage this week.It’s a seminal Asian American/Filipino American story.Like many of the strikers, my father was one of the original Filipinos to arrive in America in the ’20s. He came to San Francisco from a farm province in the Philippines, but he chose to stay in the city to work in restaurants and hotels, eschewing the fields. He didn’t escape the racism and discrimination his fellow Filipinos faced in Delano. There was plenty of that in San Francisco. And the anti-intermarriage laws fueled by angry white male nativism applied throughout the state.But the Grape Strike gave those in the fields a real way to stand up and fight back. In a struggle that would last more than five years, the fight for fair wages and better conditions through the cry to boycott table grapes would attract iconic newsmakers like Robert F. Kennedy and Martin Luther King, Jr. to Delano. It would also make an international labor hero of Cesar Chavez.The media made Chavez the face of the strike, but the heart and soul of the union from the very beginning was always Asian American. Filipinos were the vast majority of the workers who walked off the job when their demand for a $1.40 hourly wage was not met. Their leader wasn’t Chavez. It was Larry Itliong.I’ve written about Itliong in this space before, but his story can’t be told and re-told enough. For the most part, he remains forgotten and missing from the history books. If he’s included, it’s written in shorthand or dismissed as a mere footnote. It’s the curse of most notable Filipino Americans, indicative of the inability of American society to understand exactly who and what Filipino Americans are.Our invisibility becomes us. But Itliong was hardly Chavez’ sidekick in one of the most significant labor movements in the last 50 years. 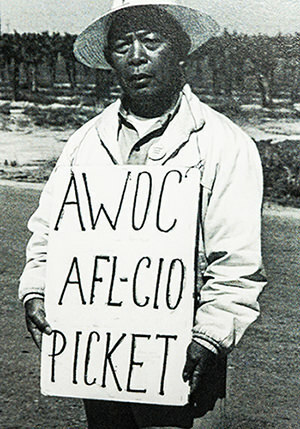 That became the true hallmark of the strike–the bringing together of new immigrants –the combined might of the growing labor force coming from Mexico, with the aging and dwindling Filipino labor force that had first arrived to America in the ’20s.In many ways, the new United Farm Workers, the UFW, was a natural evolution of the changing work force in the fields. “It became clear to Larry that Mexicans were the key to the success of the strike,” said D awn Mabalon, a history professor at San Francisco State who is writing a book on Itliong. “The only way to win was with each other.”Mabalon said that without cooperation, Filipinos would be used as scabs if Mexicans went on strike, and Mexicans would be scab labor if the Filipinos were on strike. “The strike fused the community,” Mabalon said. And in 1965, when people were thinking about civil rights in general, the farmworkers became part of a social justice movement and made America care.That still doesn’t explain why Chavez eclipsed Itliong so badly in terms of the historical recognition for the strike. Paul Chavez, Cesar Chavez’ son and the president of the Cesar Chavez Foundation, admitted there were some hard feelings.“Of course, there were,” said Chavez, who recalled his childhood around Itliong, whom he called Uncle Larry. “Who would not be offended if they felt their contributions weren’t recognized…I think there’s a need to recognize the contributions of people in Delano, Latinos and Filipinos alike.”But how Itliong became invisible may be just a matter of timing.“He left the UFW in 1971,” said Mabalon. “And even though it wasn’t publicly acrimonious, I think there were some hurt feelings and bitterness. 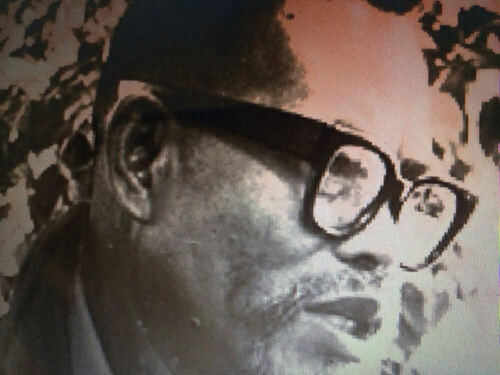 He died five years after he resigned in 1977.”It meant that when America and the media finally were giving attention to the farm labor movement and to Cesar Chavez and Dolores Huerta, Itliong had been dead for nearly 20 years. “He wasn’t alive to speak for himself and to be someone that people in the ’80s and ’90s could connect to and recognize in the media.”Itliong’s death in 1977 to Lou Gehrig’s disease and ALS compounded the tragedy.“Saddest day of my life,” said Johnny Itliong, who was just 11 years old when his father died.But the harvest may yet come for Itliong’s father. California State Assemblyman Rob Bonta has passed a bill making it mandatory to include the story of Larry Itliong and the Filipinos in the fields in K-12 classrooms. Projects like Project Welga at UC Davis are working hard to provide some curriculum resources on the web for this year. Also, Gov. Jerry Brown in July declared Itliong’s birthday, Oct. 25, as Larry Itliong Day. Union City, Calif., has named a school for both Itliong and Philip Vera Cruz; in San Diego, a bridge was named for the pair. And in Stockton, a move is on to honor Itliong, a native son, by renaming a street in the heart of that city’s Little Manila. The effort is being led by Dillon Delvo, whose father was an AWOC organizer who worked with Itliong. “It’s the responsibility of the community to do this,” said Delvo. “Larry Itliong is actually from Stockton, and hardly anyone knows that.”Slowly, a little recognition is finally coming to Larry Itliong, fifty years after he sparked a movement. It could be a real turning point for Filipinos in America, now the largest and fastest growing Asian American group in California. 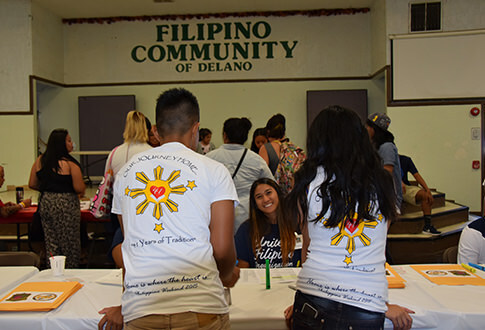 Top photo by Emil Guillermo; other photos courtesy of Filipino American National Historical Society-Delano Chapter.